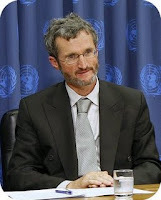 Summary of a New York times op-ed by Georg Kell, my previous boss and executive director of United Nations Global Compact, a U.N. initiative to encourage businesses to adopt socially responsible policies. But given the level of inaction and the counteracting forces of organized opposition, further steps will be needed to truly tip the scale in favor of positive business action. 5. climate change is an urgent ethical issue for the broader role business in society. Of course, it would be naïve not to acknowledge that there will be industry losers in the end. There will be those companies and sectors that are just too entrenched in the high-carbon economy to adapt and change. Achieving the low-carbon economy of the future will not be possible without the active role of business. Some have taken up the challenge. It is time for the fence-sitters to join this effort." Read the full op-ed at New York Times.